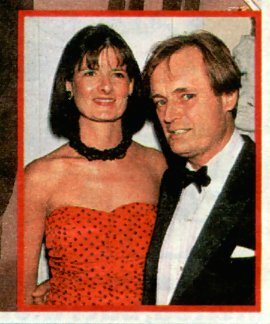 Everything is just Ducky with David McCallum these days. Known for the last 40 years as Illya Kuryakin, the character he played on the NBC spy series The Man From U.N.C.L.E., the Scottish actor now has another meaty TV role - eccentric medical examiner Dr. Donald "Ducky" Mallard, on the CBS drama Navy NCIS, co-starring Mark Harmon. And like Illya, Ducky is a skirt-chaser, even though the still-young-looking McCallum is 70 years old. "If you have someone who likes to chat up young girls and you cast somebody who's really elderly looking, it could get tacky," he says. "Somehow, I get away with it, which I think is a great compliment." But it hasn't always been smooth sailing for the smooth-talking actor, who has been stalked by tragedy. In 1967, his 10-year marriage to first wife Jill Ireland collapsed and he quickly married curvy model Katherine Carpenter the same year. He and Katherine, now an interior designer, have been wed for 36 years, and have two children and grandchildren together. In 1989, his adopted son, Jason, one of the three children he had with Ireland, died of an accidental drug overdose. Jason's long-term battle with drugs was chronicled by Ireland in Life Lines, which was made into a TV movie. Another son, Val, is a renowned guitarist, who has recorded a CD with Sheryl Crow and played backup to Vonda Shepard on the Ally McBeal soundtrack. Music is in McCallum's genes. His violinist dad eventually became concert master of the London Philharmonic Orchestra and his mom was a cellist. But McCallum made his mark as an actor playing the hip mop-top Russian-born spy, sidekick to Robert Vaughn's Napoleon Solo, on the series that ran from 1964 to 1968. "I'd never heard the word sidekick before," admits McCallum. "The first episode I had four lines and an accent." But there was something about Illya that set teenage girls' hearts racing and he starred in the role in six Man From U.N.C.L.E. movies. Now, he has thrown himself into his Ducky new part as a Navy pathologist, "witnessing autopsies and seeing just what a guy like this does. I can smell the coroner's office right now just by thinking about it." He acknowledges that a character named Donald "Ducky" Mallard is quite "silly," but he has a blast doing it. "We're dealing with deaths and all these terrible things, but someone like this has a chance to express himself with a sense of humor," McCallum explains. "It's black humor." While Ducky is lecherous and a flirt, "he doesn't mean anything by it," he defends. And McCallum doesn't care about getting mail from fawning female fans, but adds, "I hope I get letters from pathologists."